Sorry, the cookie cutter itself is not made of chocolate- but the 4 1/4" Ann Clark Chocolate Moose Cookie Cutter does include a recipe for chocolate-y cookies AND a frosting recipe! 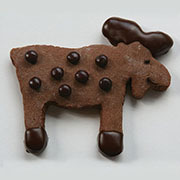 If you love moose, and can't live without chocolate, this is for you. 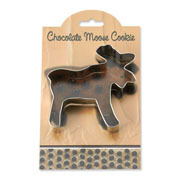 Use this fun cookie cutter to make moose cookies or crafts. Made in the USA.